Daddy: Yep, he was listening with his special microphone and he was watching with his telescope over all of the Jews of the world. He watched and he watched and he watched and he saw a boy. The boy was talking to his father. The father said, "So, Ezra, what's your favorite thing about Hanukkah?" Ezra said, "The presents." His father said, "Okay, I get that you like the presents but what's your second favorite thing about Hanukkah?" He said, "The presents." Then the father said, "Okay, okay, well then what's your third favorite thing?" "Presents." "Fourth favorite thing." "Presents." "Is there anything that you like except for the presents?" The boy said, "Nope." Then his father said, "Well, do you know what the meaning of Hanukkah is?" The boy said, "Nope." Hanukkah Harry decided to come down and to teach this boy a lesson. He got into his shuttlecraft and he flew down to the Earth and he went to their house. 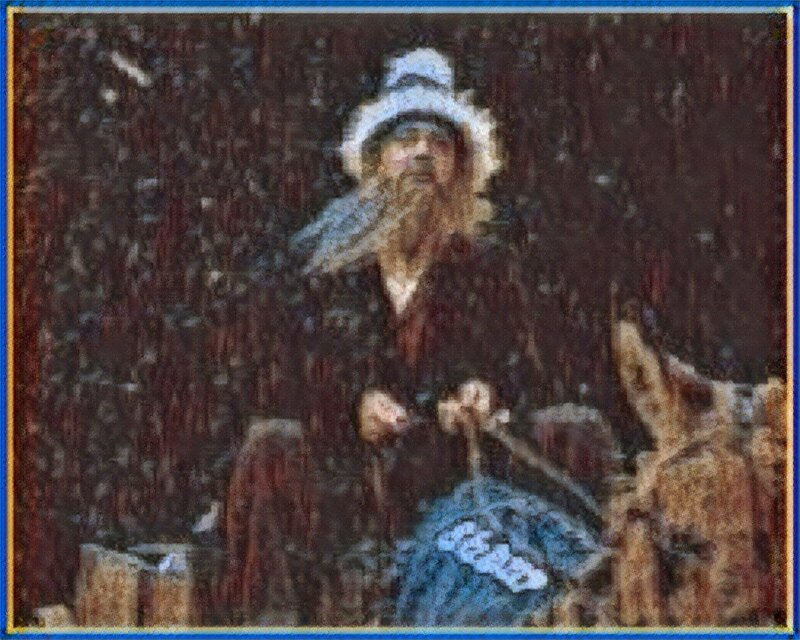 He knocked on the door and the father answered the door but Hanukkah Harry was in disguise as a poor beggar. Daddy: Hanukkah Harry waved his hand and then he whistled. The father and son's house disappeared. There they were standing there with no house. Then Hanukkah Harry whistled again and all of their stuff disappeared. Then he whistled a third time and everything was gone except for the clothes on their backs. He whistled one last time and all of a sudden their clothes got all raggedy with holes in them. He said, "All right, well good luck having Hanukkah like that." He jumped in his shuttlecraft and he went back up to his spaceship. While he was leaving they said, "Hey wait! Help, help! Don't do this to us. What are you doing?" He said, "You have to learn your lesson and I'll turn you back as soon as you learn your lesson." The father said, "We've got to go find someplace warm to spend the night because it's snowing and it's going to be so cold tonight. We don't have any clothes so we got to go find a place to spend the night." The boy said, "I don't like sleeping in other people's houses. I just want to sleep by myself. Ooooh, I just want a present. Am I getting presents tonight for Hanukkah?" The daddy said, "Do you realize what happened? We have nothing now. That man took everything away. We need to find a place to go for Hanukkah and to stay warm so that we don't freeze." First they went to their neighbor's house and they knocked on the door. Their neighbors came to the door but since Hanukkah Harry had cast that spell on them the looked like poor beggars. Their neighbors didn't recognize them. Their neighbors were pretty mean too. They said, "Who are you?" They said, "We're your neighbors." They said, "We don't have any neighbors, go away." They had to go away. The went from house to house and nobody would let them in until they came to the edge of town to the house of the poorest family in the whole village. The Schnorrer family. They knocked on the door and the Schnorrer family said, "Who is it?" They said, "We had somebody take all our stuff away and we need a place to spend the night. It's getting dark and cold." The Schnorrer family said, "Well, we don't have very much but what we have we'll share with you." They let them in and they said, "We don't have any clothes to give you because your clothes are all wet but you can take your clothes off and wrap yourself in blankets and put your clothes by the fireplace." They said, "Okay, fine." They did that. Then they said, "Would you like something to eat?" The boy said, "Oh yeah, what kind of food do you have?" They said, "Well, we just have old potatoes that we cooked up. It's not really latkes, it's just fried potatoes." The boy said, "Ewww, gross." The dad said, "Shhh." They said, "Well, if you don't want it we won't give it to you. We have very little." The boy said, "I know. I'm just so hungry I have to have it." They gave him some of the fried potatoes and he ate them. Even though they didn't taste good normally to him, he really appreciated them because he was so hungry. Even though he was very uncomfortable being naked he was so nice and warm and cozy by the fire. The whole night proceeded that way where they would need something. They would give them something that they weren't used to but it would be better than nothing. The whole night happened. They woke up in the morning and the boy realized how thankful he was to be sleeping in a bed in the warmth. He said to his daddy, "I'm so thankful." The daddy said, "Me too. I'm so thankful for the Schnorrer family." The boy said, "I know and we were so mean to them. We really didn't like them just like everybody else." The daddy said, "I know." The boy said, "I think I have a new favorite part of Hanukkah." The daddy said, "What's that?" The boy said, "It's being happy for what we have. It's being together with friends and new friends and old friends." The daddy gave him a big hug and he said, "Now that's more like it." All of a sudden Hanukkah Harry appeared and he said, "You have learned your lesson." He whistled again and they were back in their own home warm and cozy as if they had never left. They lived happily ever after. The end.